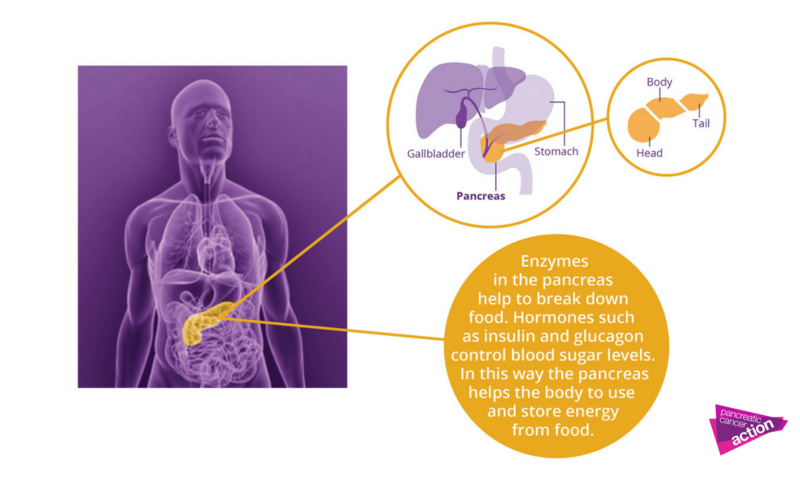 talkhealth > Blog > 2018/05 > What is the pancreas? Why is it easy to recall the location and purpose of some organs and more difficult for others? Perhaps it is because you can see a person breathing, or can hear someone’s heartbeat. The pancreas may work quietly in the body but it is in fact a very important organ and unfortunately, we only tend to hear about it when something goes wrong with it. Only half of patients have heard of pancreatic cancer before their diagnosis; so by knowing where the pancreas is, what it does, and what might happen when there is something wrong with it, you could help someone receive the early diagnosis they need in time for potentially life saving surgery. It is located deep inside the body, behind the stomach and in front of the spine. It is an organ about 6 inches long and shaped like a pear lying on its side. The wider end of the pancreas is called the head, the middle section is called the body, and the narrow end is called the tail. Making enzymes to help break down foods (using exocrine glands). Making hormones, such as insulin and glucagon, which control blood sugar levels (using endocrine glands). The pancreas is located deep inside the body. A tube called the pancreatic duct connects the pancreas to the first part of the small intestine, known as the duodenum. Digestive enzymes pass through this tube to help break down food. Another tube, called the common bile duct, passes through the head of the pancreas. This tube carries bile – a substance that helps to digest fats – from the liver and gall bladder to the small intestine. The bile duct may get blocked when a pancreatic tumour invades it. This causes jaundice (yellowing of the eyes, skin and dark urine), one of the six key symptoms of pancreatic cancer. For more information on the pancreas and pancreatic cancer, click here. Avoiding the risk factors associated with the disease, such as smoking. Maintaining a healthy balanced diet that nourishes the body. Pancreatic Cancer Action is a UK charity focussed on improving early diagnosis of pancreatic cancer, which is the UK’s fifth biggest cancer killer with the lowest survival rate of all common cancers. Founded by a pancreatic cancer survivor who proves that there is hope, early diagnosis is achievable and survival is possible, our focus is on ensuring that patients are diagnosed with pancreatic cancer at a stage that gives them the best chance of survival. One Response to What is the pancreas? Great information, as always! The pancreas is definitely an area of health that needs more awareness, so thank you for sharing.